Yesterday, I finished the first draft of my first1 novel. It came out at just over 90,000 words, which was the target I had in mind. It was a strange and emotional experience. After typing the last word, I felt like I’d been suddenly dumped out of that fictional world and back into this one, with an abruptness that almost made my ears pop. I finished it while on my exercise bike here in my home office, before midday. During the afternoon, I reopened the project at least five times to check I hadn’t imagined the whole thing. I’ve had mixed feelings of relief and bereavement, coupled with dread of the enormous set of second draft revisions looming ahead of me. I’d like to talk about a few of my experiences, and the lessons I’ve learned, while writing my first draft. 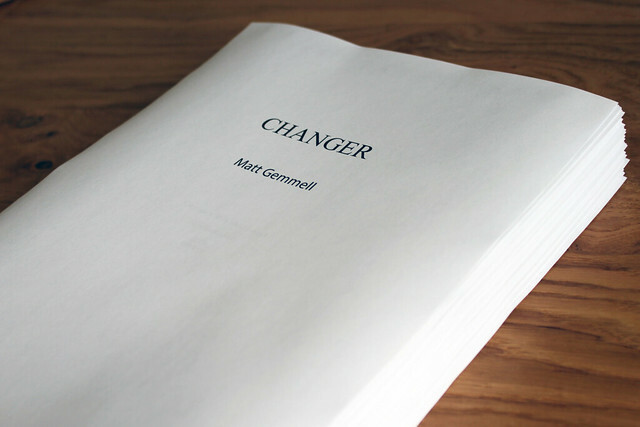 My novel, provisionally (but almost certainly) titled Changer, is an adventure thriller set in the present day. It’s potentially the first book in a loose series, but that’s a thought for another time. Printing out your first draft ready for editing is obligatory. It really puts the whole endeavour into perspective. I had only the most general idea of the story when I started out, like most people. I had an opening scene in mind (which ended up being the initial scene of the story arc proper, after a brief prologue), and I knew the general shape of the climax, but not any specifics. I jumped straight in and started writing, and enjoyed quite a bit of momentum. At around the 25% mark, I stalled. It was frustrating and discouraging, and it was because I hadn’t spent enough (any) time planning the narrative before starting to write. My approach is known as “pantsing”, which is writing by the seat of your pants. Some people swear by it. For me, it was a mistake. I then forced myself to sit down and outline the remainder of the book, to build a framework that I could write towards. I started with a few signposts for each chunk of the story, then broke those down into something like chapters, and then further broke the chapters into scenes. I added synopses for each scene, and away I went. It wasn’t entirely smooth sailing, but I never had the same sort of block I’d encountered when I ran out of steam at 25%. I plan, outline and write in Scrivener on Mac OS X, which is also available for Windows and Linux. It lets you work in a very free-form way, breaking your book down in any granularity you like. There’s a hierarchical “Binder” on the left side, where you can organise your story into folders and files. For me, the folders are chapters, and the files are scenes (Scrivener lets you easily choose how your manuscript is assembled when you export it later). This lets me shuffle around what for me is the minimum unit of a story: the scene, from a single point of view. There’s also an outliner (hierarchical too), and a corkboard view with index cards, so you have lots of ways to plan, organise and rework your story. My advice is to use the outliner to do your initial structural plan, making several passes as you progressively refine it down to at least chapters (though I’d try for scenes too, at least on a rolling basis once you start writing). Then, use the corkboard to add synopses and get a feel for the shape of the narrative. This is also a good time to use Scrivener’s labels feature to mark each scene with which character’s point of view it’s written from. Some authors take months to do their outline, extensively planning, analysing and restructuring the story before it’s written. Personally, I couldn’t go that far, because I need to actually write while the motivation is there. As a compromise, I’d suggest allotting a week for your outline. You can get a lot of quality thinking and planning done in a week if you really commit, and then you’ll be off and running. I can highly recommend Katie Weiland’s book, Structuring Your Novel, which helped me quite a bit. I put together a chart of the advice in her book, showing one possible tried-and-tested framework on which you could hang your story. There’s a reasonable number of recurring characters in my novel; about eight of significance, with a few more in minor roles. You’ll probably have a similar number, and perhaps many more. You don’t want to have to search through previous prose for biographical information - it’s much easier to keep those things separate. It’s also a great clarifying exercise to construct the sheets, and get an insight into each character as an actual person. Scrivener lets you associate images with each character sheet too, so I added photos of people who reminded me of the character or were part of their inspiration (for example, actors playing particular roles). I glanced at these occasionally to remind me of the ‘feel’ of the character, particularly when I was coming back to that character’s viewpoint after a few days writing a different set of scenes. Similarly, Scrivener encourages you to create location sheets for major settings. I didn’t use those very much, but depending on your genre and story, you may well want more detailed reference material. You’re of course free to create any kind of ref sheets you like: organisations, objects, specific subplots, or whatever is useful to you. Just don’t skip the character sheets! There are a number of fast-paced action scenes in the novel, involving multiple characters. I very quickly ran into a need to plan the dynamics of such scenes: which person is where, at any given time, and how everyone moves as the scene plays out. I initially did this with sketches on paper, but my wife came up with a better idea: Lego people! I assembled very basic “sets” (essentially just platforms for any scenes taking place on multiple levels, such as one I have in a multi-level library), and used Lego people for the characters. It was a fun distraction, but more importantly, it was suddenly much clearer to me how everyone moved through the scene. Progressions became evident where previously I’d been scratching my head. You could use anything from action figures to chess pieces or pepper pots for this, but the physicality of it really helped me to get a sense of what was going on. Whilst this is the first time I’ve finished a novel, I’ve been writing short and medium-length fiction for years. Up until now, the longest piece I’d written was perhaps 60,000 words. When you embark on your first lengthy fiction project, you think the hard thing about writing will be the plot, or the character development, or creating natural dialogue, or resolving the tale in a satisfactory way, or something else. As it turns out, it’s none of those things - though they all do present their own challenges. The really hard thing about writing a novel is the writing. Just write the thing. That’s the single most valuable lesson I learned. Get the words out, almost without regard to what those words are. Keep going, at all costs. It sounds counterintuitive, I know - like a recipe for substantial pain later, when you come to tackling the all-important second draft. And honestly, that’s true. But at least there will be a “later”. It’s so much easier to edit existing words than to pre-edit what you think you were going to say. You can tie yourself up in knots doing that, and the inevitable result is that you never finish. Just get as much down as you can, without looking back. The accommodation I made was that I was allowed to read exactly one scene, at most, before beginning work on the novel each day. If I was in the middle of a scene, I was allowed to read the partial scene up to that point. If I was starting a new scene, I was allowed to read the previous full scene in the same point of view (not necessarily the immediately previous scene in the book). That was just enough to get me into the groove, and allow me to proceed. And under no circumstances was I allowed to edit what I was reading. Momentum and motivation are everything then you’re producing tens of thousands of words out of thin air, and weaving a piece of fiction entirely of your own making. You have to keep going. There were plenty of times when I found myself blocked. Sometimes I couldn’t quite get into the voice of a character, or I was unsure what her motivations were, or how she’d react in this situation. Sometimes I felt that a chapter was dragging, and I was feeling claustrophobic. Sometimes I just didn’t know what happened next, despite the outline. There are a few techniques that I found helpful. I made a music playlist for writing. I chose tracks by mood, and my personal taste is that I prefer scores instead of songs when I’m writing fiction. I picked a series of scores based on the tone and subject matter of the novel, or rather how I imagined it might be filmed (we all do that too). When I sat down to write, the music helped get me into the right frame of mind. I learned not to tolerate pauses of more than a minute. If I was feeling stuck or distracted for that amount of time, I stood up and walked away from the desk, asking myself aloud how to move forward. Literally asking yourself “What happens next?” engages some part of your brain that feels social anxiety about responding to a direct question. All your focus converges on that question. It usually works. When doing planning or exploration of any kind, I always moved around. I paced my office floor, threw a ball against the wall, juggled beanbags, and scribbled on my whiteboard. Being physically stationary (and especially staring at a screen) are crippling for creative thought. It’s also amazing how even the most thorny plot problems can dissolve during a brisk fifteen-minute walk. There have been days where I’ve been out walking four different times. Don’t let block set in. Do something about it immediately - even if that means just doing something else for a little while. I’m comfortable with my first draft, which is to say that I think there’s some promise in there amongst the vast mire of garbage that any self-respecting novelist firmly believes their work is composed of. I’m experiencing a tense combination of shame and barely-acknowledged hope. That’s also normal. My next task is the second draft, which will be a monster (partly because I didn’t extensively plan the book before starting). It’ll mean substantial revisions, and a different style of working. I got through the first draft with daily word-count targets - thanks again, Scrivener - but the second draft is more like a war of attrition. I’ll be keeping notes during that process, too, and will share what I learn once again. The plan is to complete the second draft over the next month or two, then get a few people to read the book. I’ll then prepare a third and final draft, for a handful of people to read, sort out cover art and marketing, and then publish it (on Kindle, at least initially). I’ll be talking about that entire process in future. I’m excited about this, and also healthily scared. Update: I wrote an ebook about my method for resolving plot issues in a novel’s first draft. There are a few ways that you can support my efforts here. Firstly, keep reading - I deeply appreciate your time and attention. The occasional notes I receive from readers via email, particularly, are like ice water in the desert. Writing a novel is difficult, and it’s a solitary occupation. You might also like to be a patron of my writing, to help me keep the lights on as I forge ahead with this new career. Any contribution helps. I’d like to close with a note of thanks to my wonderful wife, Lauren. It can’t be an easy thing when your husband decides to put aside his business and his degree, and chase a lifelong dream. She’s given me nothing but support and encouragement, and she seems to truly believe in what I’m doing. I wouldn’t have got this far without her. I’m taking a few days away from the novel after completing the first draft, and I plan to start on the second draft next week. I’ll keep you posted, and thanks again for reading.